This special issue honors the 60th birthday of Professor Giancarlo Mauri from the Department of Informatics, Systems and Communication (DISCo) of the University of Milano-Bicocca (Dipartimento di Informatica, Sistemistica e Comunicazione, Università Degli Studi di Milano Bicocca) in Italy. He is a prolific researcher, and his research interests are very broad. This is witnessed by the fact that he has published over 200 papers in a broad range of research areas covering both theoretical and applied aspects of computer science. These areas include: abstract data types, syntactic monoids, trace languages, Petri nets, clustering techniques, pattern matching, cellular automata, picture languages, neural networks, evolutionary algorithms, computational learning theory, splicing languages, particle swarm optimization, bioinformatics, DNA computing, and membrane computing. 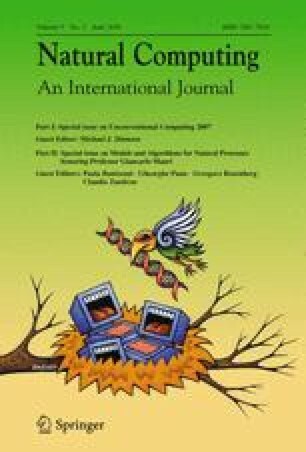 Since natural computing constitutes currently his most active research area, a special issue of this journal is very appropriate on this occasion. He has also made significant contributions in serving the scientific community on local, national, and international level. For example, he was the director of the Department of Information Sciences of the University of Milan, the President of the Italian Chapter of the European Association for Theoretical Computer Science (EATCS), President of the IFIP Working Group of Cellular Automata, and he is the Secretary of the European Molecular Computing Consortium. He has been the organizer, the program committee chair, and a steering committee member for a number of prestigious conferences. Also, he managed many research projects on local, national, and European scale. He is a very modest and friendly person, always ready to help. He is a very appreciated and reliable scientific collaborator, which is witnessed by an impressive number of co-authors of his publications. This issue consists of papers contributed by his collaborators—many of them his former PhD students. It covers some of the areas of natural computing where Giancarlo made significant contributions. We thank all contributors and the referees for very fruitful collaboration in the production of this issue.